The Regional Election by indirect ways, RIP of Democracy? #ShameOnYouSBY and #RIPDemocracy is a popular hastag on social media, twitter. The Hastag this is the communities' reactions Indonesia Board decisions on Legislative indonesia which confirmed the election in-law (popularly known as PILKADA) in an indirect way. Its means, democracy in Indonesia is decline (regress). General Election In fact, in 2004, the indonesian public for the first time will be able to choose their leaders directly. At that time, Susilo Bambang Yudhoyono and Jusuf Kalla was elected as president and vice president. President Susilo Bambang Yudhoyono (SBY) lead Indonesia during two periods. In the Second period (2009-2014), he is accompanied with Boediono. Boediono was the former president director of Bank Indonesia. So, Boediono did not come from political parties. President Susilo Bambang Yudhoyono is a leader and chairman of the board, the Democratic Party. The Democratic Party is the party that is not bound with two side politics at the moment, the Coalition Red and White (in English is a Coalition red-and-white =KMP) and The Coalition Jokowi-JK. So, the voice of one came from the democratic Party is required by both groups who competed in the parliament. The Coalition Red and White regional head election want to be returned and selected through Regional House of Representatives. The Coalition Jokowi-JK wished to remain as now. The Democratic Party again is a member of the coalition red-and-white in the election president of the Republic of Indonesia, in July 2014. 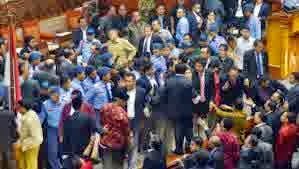 But the position the democratic Party that dynamic bargaining position and have in the parliament, the democratic Party proposed conditions to the coalition Jokowi-JK prior to support the election directly. But at the end, the democratic Party maneuver and leave parliament (Walk out of the council was the reason, there is no. meeting point. Proposal and have not been addressed conditions from his party is seriously at least it is their claim. As a result, the voice of one supports the election in directly to lose unequivocally. The number of votes they lost. difference is very far. This defeat by the community is considered as the death democracy. President Susilo Bambang Yudhoyono has been identified as a figure who should be responsible. Because, he was a leader the democratic Party. So far, the democratic Party known to be very solid. Therefore, SBY was considered to be well acquainted with the walk out members his party. It is very surprising, when he admitted that he was disappointed with the decision of legislative council. Therefore, should his party can prevent this decision. 0 Response to "The Regional Election by indirect ways, RIP of Democracy? "